Nobody had an answer for Bay of Plenty’s Cody Cooper at the weekend’s Honda New Zealand Motocross Grand Prix at Woodville. 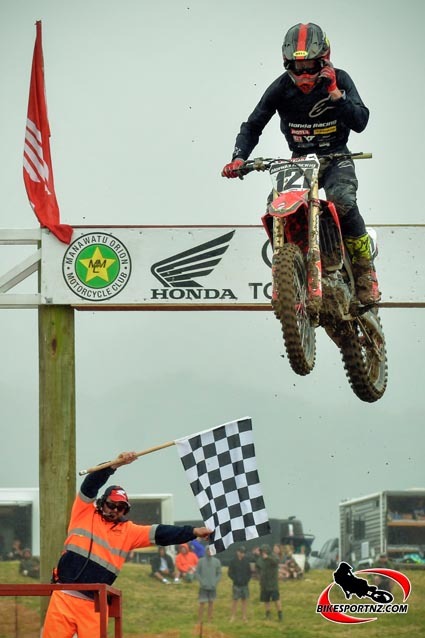 The 58th annual running of the iconic motocross, at the eastern end of the Manawatu Gorge, again attracted the cream of talent from New Zealand and Australia too, but Honda rider Cooper was determined that he would again be the man to stand top of the podium. With gale force winds and constant drizzle ruining an otherwise perfect event, organisers were forced to scale back the race programme, allowing only two races for each class, rather than the traditional three races. 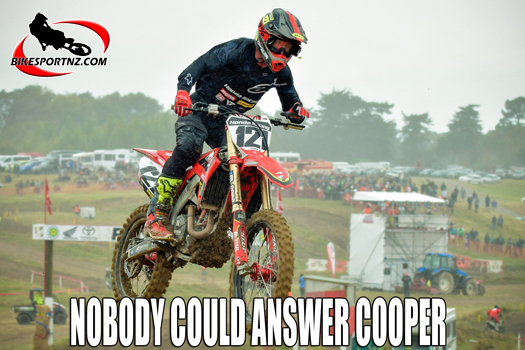 But this was of little concern to the 35-year-old Cooper (Honda CRF450), who convincingly won both the premier MX1 races on Sunday and with that he also won the event outright, making it three times now that he has claimed the top trophy there. The Mount Maunganui rider had previously won the coveted Woodville GP trophy in 2007 and a second time in 2014. Runner-up to Cooper on Sunday was visiting Australian Kirk Gibbs (Yamaha YZ450F), with Taupo’s Cohen Chase (Kawasaki KX450F) rounding out the MX1 podium. “I didn’t realise that the Woodville trophy would not be a stand-alone, separate race this year and it all hinged on me winning the MX1 class,” said Cooper. “That meant I really needed to win both MX1 races today. So it didn’t really matter that I won the first race if I didn’t win the second one, because I could lose out on the count-back rule. “That’s why I pushed pretty hard at the start of race two, to open up a gap over Gibbs and the others. I felt quite comfortable. It seemed we were actually going at quite a slow pace until about halfway through the race, when Gibbs tried to come at me. So I put some heaters (fast laps) down and pulled away again and I think he gave up after that. Cooper is in the midst of a golden run at the moment. Since returning from the United States at the end of August, where he managed 11th overall in their 2018 national motocross championships series, Cooper has won the MX1 class at the Waikato Motocross Championships, then dominated the MX1 class also at the annual Honda Whakatane Summercross just after Christmas. Just a week before the Woodville GP, Cooper had ruled the MX1 roost at the annual King of the Mountain Motocross in Taranaki, the same venue that will host the opening round of the nationals this coming weekend. His MX1 class and GP trophy wins at Woodville on Sunday have only further emphasised his readiness for the four-round New Zealand Motocross Championships. The six-time former New Zealand MX1 champion had to give up his national title to Aussie invader Gibbs last season, Cooper settling instead for second overall in the 2018 nationals, but his dominance over Gibbs at Woodville, and the rest of New Zealand’s elite 450cc riders too, must surely make him firm favourite to win back the No.1 plate this year. Other individual class winners on Sunday were Takapuna’s Hamish Harwood (MX2 class and senior 125cc class); Tauranga’s Brodie Connolly (Roddy Shirriffs Memorial trophy, top rider aged under 21); Hamilton’s Amie Roberts (women’s class); Whakatane’s Darren Capill (veterans’ class); Waipukurau’s Steve Sergeant (river race class); Taupo’s Jake Tomblin (vintage motocross). Individual class winners on Saturday were Australia’s Brad West (14-16 years’ 250cc class); Pukekawa’s Jack Dunlop (15-16 years’ 125cc class); Rangiora’s Cobie Bourke (12-14 years’ 125cc class); Hamilton’s Dylan Westgate (14-16 years’ 85cc class); Invercargill’s Jack Symon (12-13 years’ 85cc class); Leeston’s Kobe Thoms (8-11 years’ 85cc class); Leeston’s Kase Thoms (8-11 years’ pro 65cc class). Winners on the mini track on Saturday were Pahiatua’s Brody Sparrow (4-7 intro trail); Cambridge’s Nico Verhoeven (4-7 intro 50cc MX); Christchurch’s Levi McMaster (6-8 50cc MX); Tauranga’s Arama Te Whetu (7-8 65cc MX); Dannevirke’s James Joblin (8-11 small wheel trail); Rewa’s Logan Clare (8-11 big wheel trail); Invercargill’s Ryder Sheehan (9-11 65cc MX).